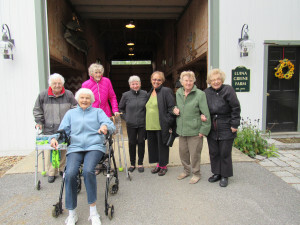 Luina Greine Farm is pleased to announce FREE private tours to any group of seniors. Your private tour will last approximately 45 minutes, and consist of 3 stops. All stops are easily accessible for seniors of all abilities and we have ample parking available as well. Originally built in the 1800’s, our beautifully restored barn is home to our alpacas and miniature donkeys. 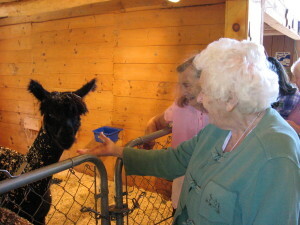 You will have the opportunity to feed one of the alpacas and one of the miniature donkeys. Just steps away from the barn is Luina Greine Farm’s expansive goat and sheep pen. You will be able to observe our 2 nigerian dwarf goats and our newest addition our miniature Shetland sheep. You will also have the opportunity to interact directly with the sheep and goats. They are gentle animals and fun to play with. 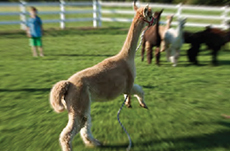 Visit our Country Store – See all the amazing items that come from our alpacas’ fiber, including shawls, blankets, mittens, hats, scarves, socks, teddy bears, and much more. All 3 stops are within 50 yards of each other. The ground is flat and wheelchair accessible. For the adventurous, you can tour the more than 19 acres of rolling meadows and apple orchards and observe all the animals playing in our fenced in area! The tour is open to any group of seniors and is available any day of the week. Reservations are required. Simply send an email to shelly@luinagreine.com or call Shelly at 978-790-5286. Please include your name, the size of your group, and your preferred date and time. Luina Greine Farm offers ample parking within steps of the start of the tour and offers plenty of space for any size van or bus to turn around in. We look forward to your group joining us soon!